They emerged from the forest just as I was cycling past. Exactly where and for how long they’d been out hunting I have no idea. Communication, at least in a manner of pointing and miming, centered on the gun and several decapitated animals in a woven basket. The Central African Republic was one of the poorest countries I cycled through. The tattered clothes and malnourished physiques of many people I met were a clear enough indication of that. 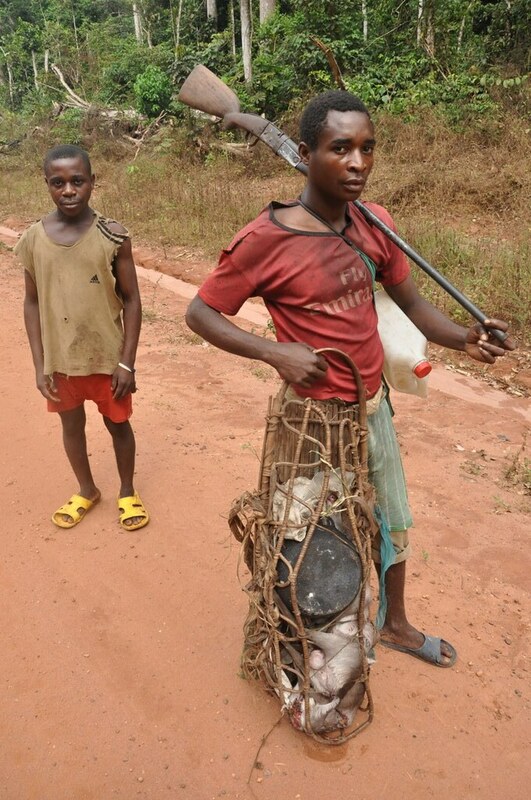 Bushmeat was also common fair, particularly for pygmies like this who lived in the forest. For several days en-route to the capital Bangui, I passed through a number of villages inhabited by such people. Occasionally the meat would be hung up on a stick and sold at the roadside, although there was rarely any traffic passing by and flies seemed to be the main beneficiaries. The population of central Africa’s pygmies is in decline. Historically their short stature and hunter-gatherer lifestyle has subjected them to subhuman status by colonial officials and other Africans. Now, assimilation with other Bantu tribes and loss of their original homeland through deforestation means less remain. I have no idea if these two men had ever been photographed before. I often wondered this when taking pictures of people in remote parts of Africa. Their faces, somewhat worried at first, soon relaxed when I showed them their image on the digital screen. Not for the first time I wished to have a Polaroid camera with me. You can read my blog post in which this photo was taken here. I was just in CAR. That is not a Pygmy holding a rifle. Pygmies are prohibited from owning firearms. Only the Bantu may do so. Th smaller chap is a Ba’Aka (the correct name for the pygmies in CAR). Bantu employ Ba’Aka as trackers. The Bantu sell into the countrywide and Africawide bushmeat market, severely depleting the forests. Thanks for clarifying that. I do remember being told something like that before, so was unsure and assumed the guy with the rifle was somehow half bantu/half pygmy. It seemed difficult at times to distinguish the difference, but I’m sure those who know more might tell me otherwise.